The number of drone fines issued by aviation authorities is increasing. Read about the most significant cases of prosecutions involving unlawful drone operations. I see an emerging trend: more and more authorities are starting to prosecute unlawful drone operations. Let’s check 15 significant cases of drone operators’ prosecution, giving a little insight into what it means to be non-compliant with local drone regulations. The Federal Aviation Authority (FAA) is presently in charge of drone regulation at the federal level in the U.S. (even if things might change considerably under Trump’s administration) but states and local government entities also have the authority to pass local laws in their jurisdiction. According to Motherboard, the FAA had fined 24 drone pilots up to June 2016. It’s interesting to note that even where enforcement efforts have been put in place, FAA’s focus up to 2016 has been on punishing reckless behaviours, rather than illegal commercial operations, as the 2016 Motherboard analysis of the 24 prosecutions found out. Let’s check a few significant drone fines in the U.S. This is the largest of all drone fines ever issued by the FAA to date. The initially proposed fine in October 2015 to SkyPan International, Inc., of Chicago, amounted to an impressive $1.9 million for conducting 43 illegal drone flights in congested airspace over Chicago and New York City between 2012 and 2014. SkyPan was further accused of operating 65 aircraft without proper communication tools and without receiving an airworthiness certificate and registration. The company eventually settled with the FAA in January 2017 for $200,000. Besides the $200,000 civil penalty the company also agreed to pay an additional $150,000 if it violates federal aviation regulations again in the next year, and $150,000 more if it fails to comply with the terms of the settlement agreement. What drone pilot Caterina considered a hobby has landed him in trouble with the FAA, which in 2016 levied $55,000 in fines against him for violating five aviation regulations. said Jason Snead, a FAA policy analyst at The Heritage Foundation. Xizmo Media, a New York video production company, was hired by Fordham University to shoot footage of its 2015 commencement ceremony. The FAA fined Xizmo because its drone wasn’t registered, flew in a reckless manner, and also pulled out several other regulations that are normally used for manned aircraft. Xizmo eventually settled with the FAA for $5,000. The first custodial sentence was given to a Paul Skinner, a professional Seattle aerial photographer, whose out of control drone knocked a woman unconscious at a parade in 2015. The Civil Aviation Authority (CAA) is in charge of UAS regulation in the United Kingdom. The CAA has been actively enforcing drone regulations, with a focus on punishing both professionals using drones for commercial purposes without being licensed, and reckless operations. Drone enthusiast Nigel Wilson admitted nine breaches of drone regulations for illegally flying his drone over football stadiums across England and over buildings in central London where he had no direct sight of the aircraft. He also flew his drone within 50 meters of several buildings. All these acts are offences under the 2009 Air Navigation Order. His videos on YouTube showed views from heights of at least 100 meters of Premier League, Champions League and Championship football matches. Other videos showed views of Big Ben from close range, the Queen Victoria Memorial next to Buckingham Palace, HMS Belfast at its mooring on the Thames and the Shard, Europe’s tallest skyscraper, all accompanied by a dramatic soundtrack. Richard was fined £1,125 in October 2015 for illegally flying his drone over Hyde Park without permission during a shoot for a promotional video. The drone flew in controlled airspaces without consent from the Civil Aviation Authority. He was also charged for flying the drone 10 metres away from traffic and pedestrians. On 9 November 2013, staff at Alton Towers Resort observed a quadcopter flying over the X Sector of the resort. Mark later posted video clips on YouTube which showed that he had launched the quadcopter some way from the resort, beyond visual line of sight. Stafford Magistrates’ Court convicted him for not maintaining direct visual contact with his drone and flying within 150 metres of a congested area. Transport Canada is the institution for regulating drones in Canada. Have a look at the latest documentation published on drone laws as changes have been applied recently, especially for hobby pilots. Transport Canada launched a record 118 investigations into the illegal use of UAVs in 2016, 16 of which resulted in drone fines. That’s more than three times the number of fines issued in 2015. Moves Media Ltd., a Vancouver video production company, was fined $5,000 for operating a drone contrary to its Special Flight Operations Certificate issued by Transport Canada. This case depicts well how navigating through all the legal authorizations required to perform your job can be painful but both mandatory and necessary. Julien Gramigna, photographer and co-founder of the company VuDuCiel, was fined $1,000 by Transport Canada in December 2014. The fine claims the use of a drone to take photos of a house for a real estate agent without proper federal permit. Australian drone laws are established by the Civil Aviation Safety Authority (CASA). Drone regulation for both recreational and commercial use are extensively explained on their website. The CASA has started to prosecute illegal behavior of drone pilots seriously in the last few months. 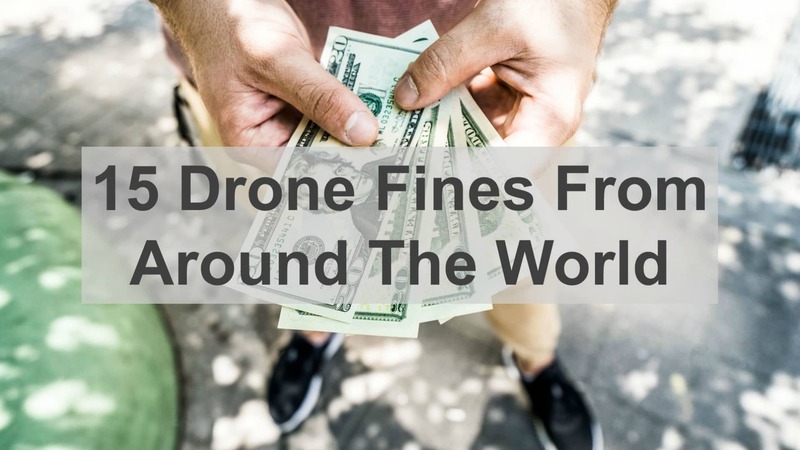 For instance, a person was fined $1440 AUD for flying a drone in Sydney Harbour, which is a restricted airspace, while another person was fined $900 AUD for flying a drone above a children’s Easter egg hunt in Canberra. TV presenter Sylvia Jeffreys and her journalist partner Peter Stefanovic thought it would be a good idea to ask one of their friends to catch images of them popping champagne at their wedding using a drone. Their friend now faces a $900 AUD fine for “hazardous flying at and near guests” after the drone footage uploaded on Instagram got CASA’s attention. CASA’s director, Shane Carmody, made no apology for the fine. An Australian recreational drone owner was fined $850 AUD by the CASA after uploading numerous illegal drone videos on YouTube. Each of his uploaded clips could have been charged between $850 and $8,000 AUD. The $850 fine was large enough to scare the flights out of this pilot as the drone in question quickly appeared for sale online. A university student has copped a $900 AUD fine for flying a drone close to a police helicopter conducting a rescue operation in the New South Wales Blue Mountains. The drone then crashed into a tree on a private home. France is a worldwide pioneer in UAV regulation, having adopted civilian drone legislation in the spring of 2012. Since the legislation went into effect in 2012, around 30 legal cases involving drones have given way to criminal punishment by the French Aviation Administration. Almost all of the offenders were slapped with small drone fines, but one person earned a one-year suspended prison sentence. In this case, he had flown a civilian drone dangerously close to a helicopter. British reporter Tristan Redman was charged a €1,000 drone fine in February 2015 by Paris Court for flying a drone several times over central Paris. The journalist, who was compiling a piece for Al-Jazeera news, also had his drone confiscated. The Ministerie van Infrastructuur and Milieu handles drone regulation in the Netherlands. Documentation in English about drone rules in practice can be found here. André Rieu, the famous Dutch violinist and conductor best known for creating the waltz-playing Johann Strauss Orchestra, was fined for flying a drone filming a performance on the Vrijthof in Maastricht. The drone was flown above the city center (which is forbidden by current Netherlands drone regulation), at night, in a CTR zone (Maastricht has a busy regional airport), in close proximity to the 12,000 people attending the concert, and without a permit. The amount of the fine was not divulged but the Dutch newspaper De Limburger estimates it around €8,000, the largest fine for illegal drone operations given by the Netherlands authorities to date. The Civil Aviation Administration of China (CAAC) is in charge of regulating UAS in China. Since May 2017 Chinese drone operators in China have to register under their real name with the CAAC. In 2015, a staff member from Beijing UAV Sci-Tech Co, was sentenced to 18 months in jail by the CAAC after a drone from the company disrupted commercial flights. In conclusion, this list of drone fines highlights that drone fines are a serious deal and it’s more important than ever to be compliant with local and federal laws.